For all of the historical period covered by the surviving music for lute, lutes were strung with gut. For most of the 20th-century revival of the lute most players have used nylon strings, plain nylon for the treble strings and nylon floss covered with silvered metal for the basses. Realizing that modern stringing produces a different sound from gut stringing, many people have attempted to revive the manufacture and use of gut strings in an attempt to get closer to the original sound of the lute. This short article summarizes the story so far. Here is a summary of selected points from the main sources. Links are provided to full texts. Strings are made from the guts of castroni (castrated male lambs). They taper, so you must tie the fifth and sixth courses with the thick end at the bridge and the second, third and fourth courses with the thin end at the bridge. Strings from Munich are more even in thickness. Strings must be true, but if slightly false the two strings of the course must be matched – a true string and a false string together just make a false course. Sometimes you can solve this problem by turning one of the strings round. It is important to get the right tension to get the best out of the lute – different lutes, and different sizes of lutes, require different tensions to sound at their best. Strings must lie close to the frets all the way up the fingerboard. A Varietie of Lute Lessons, Robert Dowland, London, 1610. Strings must be fresh; unscrupulous merchants sometimes try to pass off old strings as new by oiling them, to make them look clear. Treble strings should be “a faire and cleere whitish gray, or ash-colour”. Stiffness is good – press on the end of a string to test. Newness is most important for the thinner strings (1st to 3rd courses), thicker strings can be older but they should still be “cleere against the light, though their colour be blackish”. Some strings are coloured, but it is best to choose the lightest colours. There are two sorts of strings, “Great and Small”: the best treble strings are from Monnekin (=München?) and Mildorp in Germany; the best bass strings are made in Bologna, transported via Venice and known as “Venice Catlines”. Strings made in the summer are better than strings made in the winter. The best strings are from Rome, though bass strings and octaves from Lyons are also good. Good strings are hard and transparent, strong, smooth, well-twisted and true. They are spoiled by moisture and can be protected by wrapping in oiled paper. The two strings of a course must be the same thickness and this is most easily achieved if they come from the same length, though this is rarely possible. Musick’s Monument, Thomas Mace, Cambridge, 1676. There are three sorts of strings, Minikins for trebles, Venice-Catlins for mid-range strings and the larger octaves, and Lyons, or better, Pistoys (a deep dark red colour) for basses. Minikins and Venice-Catlins are the same price, and both are good if they are clear, smooth, and stiff to the finger. Test trueness not just for the whole length but for shorter lengths corresponding to the fretting requirements. String materials: strings were made from sheep gut (“cat” gut is probably a name rather than a material) – no other substances are mentioned. Places of manufacture: range from Rome in the south to Strasbourg in the north, but for thinner strings “Minikins” (from Munich?) and for thicker strings “Venice-catlins” from Bologna seem to be the favourites. Packaging: strings were made in lengths (“knots”) at least twice as long as was needed on the instrument. “Double knots” are presumably twice as long. They are then “made up” into “bundles”, more knots to a bundle for thin strings than for thicker ones. The whole issue of packaging has been largely ignored by modern writers but it can give vital clues as to the nature of the strings: all the descriptions of “knots”, “bundles” and how to extract a string from them suggest characteristics very different from those of modern gut strings, which must be carefully coiled because bending round sharp corners ruins them. 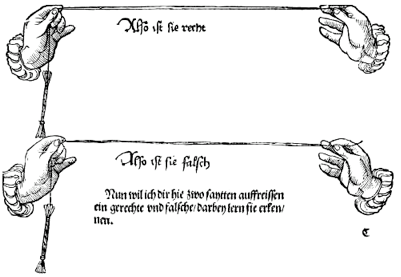 The picture of testing for trueness in Gerle’s book of 1546 is one of several depictions which shows what a “knot” was like (see top of page). We might get away with this kind of wrapping for a very pliable substance like household string, but not a modern gut string. It reminds me of skeins of tapestry wool. This apparent pliability is also often seen in spare lengths of string sticking out of pegboxes in paintings, and although it seems at odds with the emphasis on “stiffness to the finger”, we should remember that stiffness is relative. Types of string: If we accept Mace’s judgement that Pistoys were really a kind of Venice-Catlin, then we have only two sorts of string, Minikins (perhaps up to .65mm) and Venice-Catlins (greater than .65mm). There is no mention of roping or loading, and the same criteria for goodness apply to both – clearness to the eye and stiffness to the finger. Selecting good strings: Good strings are newly made, strong, well-twisted and smooth, clear against the light, and stiff to the finger. They must also be tested for trueness as they are put on the instrument. Storage: Moisture is the enemy of strings so they must be bound up closely together and kept in an oiled paper or bladder. In order to maintain a suitable working tension, strings have to get progressively thicker as they go lower in pitch. The sixth course of a lute is two octaves below the first course, and even when strung at a much lower tension still has to be about 3-4 times thicker. This increase in thickness as you go down into the bass creates a problem: as the strings get thicker they also get less elastic, until the point is reached where the sound is so short-lived and out of tune as to be unsatisfactory. Opinions will differ as to exactly where this point is, but to modern ears it is a little more than an octave below the first string – the fourth course is OK, the fifth is not. This judgement is perhaps supported by the historical use of different strings at this point (the fourth course is the first of the Venice catlines used by Dowland). If the thicker string could be made more elastic, it would work better. One way to achieve this is to put more twist into the string as it is made. Just how much further down into the bass a high-twist string will take us is a much more open question. In the mid 1970s Ephraim Segerman demonstrated that a more elastic string could be made by making a rope of thinner strings twisted together. Could this be how bass strings were made? Segerman thought so, and called his roped strings “catlines”. Unfortunately the name has stuck as a synonym for roped strings, though more recent consideration of the evidence suggests that the original “Venice Catlines” were probably not roped. In the 1990s Mimmo Peruffo, having studied the sizes of bridge holes in surviving lutes, came to the conclusion that the original strings must have been of higher density than gut in order to reach a reasonable working tension. He has experimented with “loading” the gut with metallic salts before it is made into a string. The process can increase the density to about twice that of untreated gut. Support for the loading hypothesis also comes from paintings which often show dark or even bright red bass strings. Some doubt is cast on it by the historical references to clearness because substances which are heavy enough to have a loading effect also tend to be opaque. On the other hand the evidence from bridge holes is compelling: if strings were not loaded then they must have been at a much lower tension than we are accustomed to (according to Segerman, down to around 13 Newtons, about half what most of us would regard as sensible). One way to make the bass string problem less acute is to adopt a higher pitch, but of course this can only be done if treble strings can be made very strong, and in any case a big hike in pitch only results in a small decrease in diameter for the bass strings. Before the invention of the splitting horn in the 18th century, gut strings were made from whole guts and may therefore have been considerably stronger. However, much higher pitches are still not available – modern scholars seem to agree on the breaking strain of gut treble strings (though not necessarily on how close to breaking point the string should be tuned). A pitch of (modern) g’ for a 60cm string length cannot be far from historical pitch. The issue of how nominal pitch relates to actual pitch is complicated, however, and discussed further in Historical pitch and the lute. The story of octave stringing on the lute is a long and complicated one. It’s not just a question of string technology, though presumably the practice did originate in the need for reinforcement of the bass sound. Secondly, for on your Bases, in that place which you call the sixt string, or r ut, these Bases must be both of one bignes, yet it hath been a generall custome (although not so much used any where as here in England) to set a small and a great string together, but amongst learned Musitions that custome is left, as irregular to the rules of Musicke. So the issue for Dowland was whether or not to use an octave on the sixth course. He says nothing about the remaining basses, and all the other evidence we have from paintings and other sources suggests that these courses would always have been tuned in octaves. We have tuning instructions for the 11-course lute and numerous paintings which show that for the “D minor” tuning octaves were used from the sixth course downwards. From a string technology point of view there is less reason to use an octave on the sixth in this tuning as the sixth course on an 11-course lute (new tuning) would be thinner than a sixth course on a 10-course lute (old tuning) and have less need of reinforcement by the upper octave. My conclusion is that it would have been usual to have octaves from the sixth or seventh course downwards on the 10-course lute. But you could have octaves higher up – there is a beautiful painting in the National Gallery, London, by Terbruggen (dated 1624), which shows a 10-course lute with octaves from the fourth course downwards. How prominent the octaves are when played depends on many things, not least the skill of the player. At first sight, the usual tuning of the 6-course lute with octaves on fourth to sixth courses seems to go against the contrapuntal style of much of the music, but a skilled player can choose to bring out an octave here or minimize its effect there, as the music requires. Many players today feel that the octaves are an essential part of the sound of this music, more a matter of colour than notes. For a fascinating account of gut string making see Dan Larson’s website.